Q: How will the window cleaning clean my building? A: We can promptly remove smudges with either outside window cleaning (for four-storey properties), rope access window washing (for tall properties), or via the common manual cleaning of interior casements. Q: Can you explain me a tad more about your water-fed pole cleaning method? A: Absolutely! This gear can expand up to 22 metres in length, allowing the cleaners to effortlessly reach and clean even the remotest corners of your windows. Q: Why don't you polish the casements with your water-fed rod? A: Our water is distilled from any residue-causing impurities. When this liquid vanishes under the sun, it won't leave any splodges behind. Q: Will you conduct your service in a stormy weather? A: Rainwater is usually unpolluted, so it won't halt us from doing our job. However, while we won't be bothered by a slight shower, a sudden cloudburst can result in unsatisfying results. During thunderstorms, we may have to postpone our service for a day of your preference to ensure the technicians' safety. Q: Do I need to wait in my home or office until the service is completed? A: No, the trained window cleaners in Paddington can easily perform outer window cleaning in your absence, as long as your property gates are unbarred. And if you want your windows to sparkle on the inside, just book our complimentary key pick-up and delivery option instead. Q: Do you treat window frames and ledges? A: Yes – we will wash your PVC or UPVC frames and sills at no extra cost! When you opt for a window cleaning Paddington session, you'll be able to renew the casements of any building at fair fees that remain unaltered by minimum contracts or undisclosed payments. See if you agree with our opinion – have a glimpse at our handy price table below. 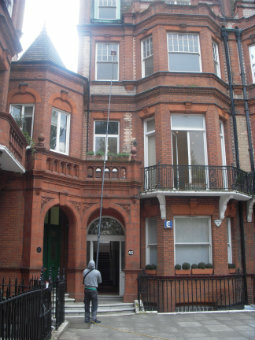 We've created our window cleaning in Paddington with flexibility in mind. As a result, our service is now frequently hired by commercial and residential customers alike. Let's review our window washing alternatives on offer. With our outside cleaning, you can easily polish the casements of any building with four or less floors. The practiced adepts will show up in a cleaning van. The window cleaners in Paddington will then connect a handy water-fed pole to the van's water tank. The special purified water will be released through a brush-head installment at the pole's end under enormous pressure. When the liquid evaporates under the sun, your windows will stay spotless for weeks to come. For properties above the fourth storey, we'll send in experienced abseilers for rope access window cleaning. Equipped with sturdy ropes, cherry pickers, and ladders, they will assess and rejuvenate any skyscraper over the course of one afternoon. Should you require risk evaluation reports, we'll readily provide them for you. We also take our job very seriously and will abide by all safety regulations. If your windows are smudgy on the inside as well, the experts can carry out internal cleaning with ladders and squeegees. Over time, we've responded to the washing calls of customers from many nearby regions. As a direct result, we expanded window cleaning Paddington's horizon and you can now spot our washing vehicles in the districts below. For those of you who'd rather book window cleaning services Paddington W2 online, fill in our get a free instant quote form.